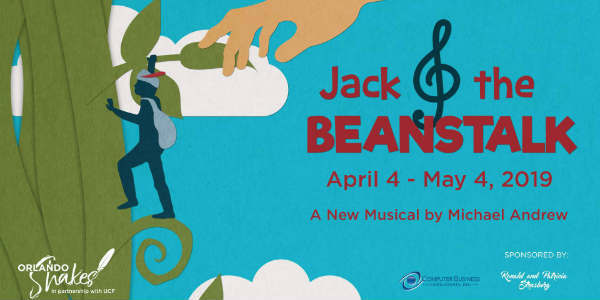 Orlando Shakes in partnership with UCF, will perform Jack and the Beanstalk, a new family musical by Michael Andrew. From the urban jungle to the quaint countryside, Jack is well-known for his sense of adventure – or at least in his daydreams. When it’s up to our hero to rescue new friends, his bravery will be put to the test. Amongst giants, mystery, and magic, join Jack on an exhilarating, musical escapade to a land above the clouds! Orlando Shakes provides students that have sensory, social, cognitive, or physical challenges the chance to participate in our Sensory Friendly performance. In addition to lighting, sound, and vocal cues being adjusted, patrons will be able to exit the theater with ease during the performance should their child need a break. Preview Dates – April 4-5, 2019 at 10:15am and 12pm. Tickets are $10 per person. Remaining Shows are on Saturdays from April 6 – May 4. Tickets are $20 adults and $15 children. Join members of the cast for free interactive pre-show fun for the whole family. The fun starts 10-15 minutes prior to every performance. Then stick around after weekend performances of Jack & the Beanstalk for a special free autograph session with the stars of the show. CitySurfing Orlando is for both the locals and the visitors. Since 2010, we have covered the theme parks and all the other fun stuff to do in Central Florida, but we also cover events, dining, shopping, nightlife, and news of interest to those who live in the Orlando area. I hope you enjoy CitySurfing Orlando and that it gets you out, about, and exploring all the things that make this city so much fun to play and stay in. Copyright © 2019 CitySurfing Orlando. All rights reserved.